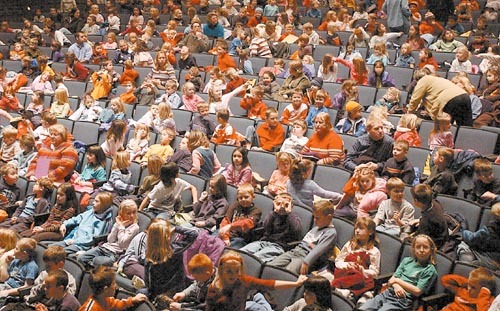 The Auditorium at Detroit's Public School 1115 was packed with kids of all shapes and sizes. They were all here to listen to their hero, Marvin J. Mavin, the Captain of the Detroit Doublejumpers and a star professional checker player in the National Checker League. Marvin was making one of his many school visits to promote the sport of checkers among our youth. And at P.S. 1115, he had come to the right place, as this school fielded several very strong teams in the Central Detroit Grade School Checker Federation. All eyes were on Marvin as he stood on the stage. "Hi there boys and girls!" he intoned in his deep baritone voice. Or maybe it wasn't all that deep. "Today we're going to talk about a really special checker opening line." A few expressions of "yeah, right" seemed to float up from the back of the auditorium. But Marvin continued without a pause. "I'm sure your coach has taught all of you to play 11-15 as your first move with Red, because it's a strong play toward the center and is considered to be Red's best starting move." A chorus of "tell us something we don't know, Marvin" seemed to emanate from the left side of the main aisle. "Now, as White, a reply often made to this is 22-18.."
"Yeah Marvin, the Single Corner, OK?" was called out by a student near the front. "Very good, yes, Single Corner, I was sure you knew that!" Marvin replied. "But how many of you know the best continuations from this point?" "Whaddya think, we're stoopit?" was heard from another student off to the left. But Marvin simply continued with his talk. "If Red plays 11-15 - hey, that's your school name!" 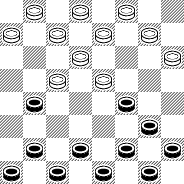 Marvin said, grinning, as the audience groaned some more, "and then after 22-18 the captures follow with 15-22, 25-18..."
"Duh, Marvin, they trade checkers, like we didn't know that!" piped up a boy somewhere in the middle of the auditorium. Marvin swallowed, paused, and went on. "So now if Red plays 12-16, and White goes 29-25, then if Red tries 10-14...."
"Aww what kinda move is dat! Da coach 'ud trow me offa da team iffn I did sumthin' like dat!" interrupted another student in a strident voice. Was Marvin actually turning just a tiny bit red? He cleared his throat lightly and carried on nonetheless. "Yes, I know 9-13 is popular here, but there's a special line in this opening that isn't seen very often. It's called "The Fun Shot" and I wonder if any of you have ever heard of it?" The audience had become suddenly silent. Evidently Marvin had taken them into new territory. "I didn't think so!" Marvin said triumphantly, and was that a slight smirk on his face? He quickly changed his expression to a neutral one. "The Fun Shot was given that name by Farmacio Fotocopia, a former player with the St. Louis Switchers, who analyzed it ..."
The audience was stirring again; they were quite young, after all. "That old guy!" one of them called, "he musta played fifty years ago!" Marvin set his jaw tightly. "Well, then, who can show me the Fun Shot? Can you?" he said, pointing to the last interruptor. The fifth grader squirmed in his seat and didn't reply. "OK then, pay attention," Marvin continued, and went over to the huge demo board at the center of the stage. "Now, here's how it goes." There was dead silence in the auditorium as the students awaited Marvin's next moves. White to Move - and Win? "So what do you think?" Marvin asked, flashing his trademark Belcher's Best Lite Lager grin. Slowly the audience began to react. There were the sounds of seats shifting and feat scuffling. Finally, one student stood up, raised his arm and said, "Geez Marvin nobody'd ever play that one! Wassamattawhitcha anyhoo, showin' us dumb stuff like that! You been drinkin' too much a that beer a yours!" This time, Marvin definitely turned red. "Well," he said. "Well, well, well." Another kid piped up, "Hey that's a deep one Marvin, ha ha ha!" Marvin paused at length, and finally seemed to become a bit more composed. He continued, "This is in fact thought to be a win for White, which is why this shot is seldom seen." Marvin grinned. Was that an evil grin on Marvin's face? "Perhaps, young man," he said in an even tone, "you would like to take the Whites, while I play the Reds, and you can show me just how smart you really are by demonstrating the win." There were hoots from the crowd, followed by cheers and applause, and cries of, "C'mon Billie, take 'em on! Show 'em yer stuff!" Then amidst nearly thunderous noise and commotion, the heckler stood up, ruffled his hair, tugged on his shirt and jeans, and started toward the front of the auditorium. Well, dear reader, just what did Billie play? Was the sassy fourth grader able to win this position against a top pro such as Marvin J. Mavin? 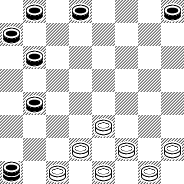 Can you win this position?